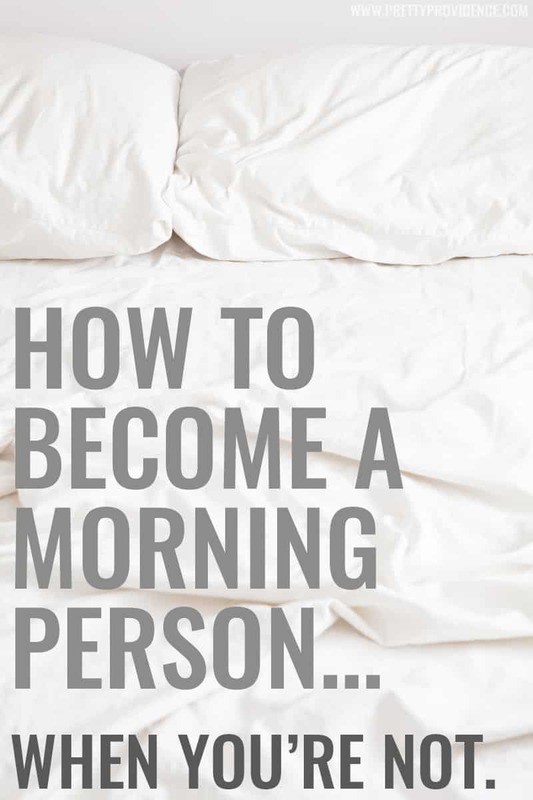 How to Become a Morning Person… When You’re Not. 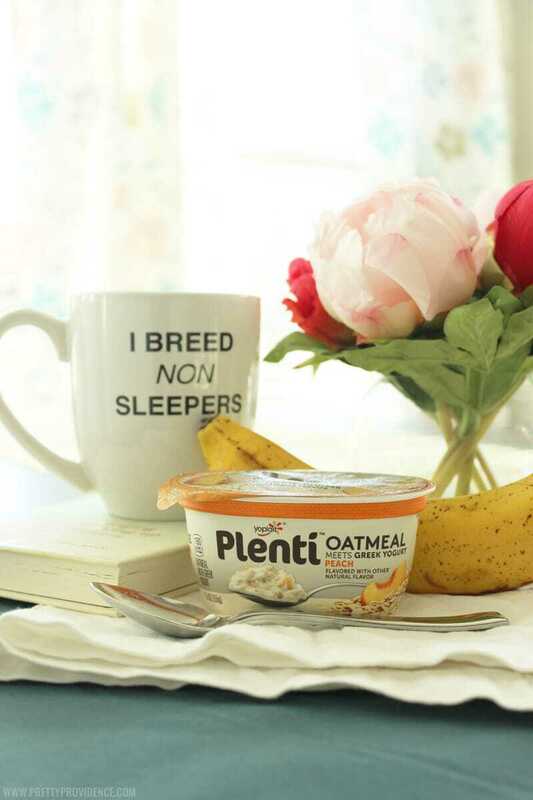 This is a sponsored post written by me on behalf of Plenti Oatmeal Meets Greek Yogurt. All opinions are 100% mine. Raise your hand if you hate mornings. I know you can’t see me right now, but if you could, I would have both hands raised! By nature, I am just not a morning person. I have never been a great sleeper and sometimes I feel like the only deep sleep I get is in the morning hours…. or I should say “got” past tense.. before I had three perky little children who had the nerve to get my husbands bright eyed morning person genes, leaving me totally alone, surrounded, and defenseless. Needless to say, in the past 4.5 years since becoming a mother to these little early risers, I have had to seriously change my habits and learn to adapt. Although it was hard, it has actually been a really beneficial change, and I am better for it. So today I thought I would share a few tips to help my fellow night owls on the road to better mornings! 1. Prepare in Advance. Even though I wake up early now, that doesn’t mean I have come to love mornings, I don’t. My body moves a step slower when I first get going and anything I can have prepped before hand, I do. I typically make a to-do list the evening before for the next day, as well as laying out clothes, meal planning, etc. The less I have to think and rush around in those early morning hours, the better. For everyone… if you catch my drift. 2. Set a Healthy Sleep Schedule. Studies show that going to sleep at roughly the same time every night and waking up at roughly the same time every morning will help your sleep quality improve drastically, and I know this has totally proven true for me. It is also an easy way to make sure you are getting enough sleep. I typically go to bed around 11:30 and wake up around 7:30, and even though I am waking up multiple times in the night with a baby I actually feel way more rested than I used to back in my 2 a.m. to noon days, and I am sleeping much less. Going to bed earlier and waking up earlier consistently will help you sleep more soundly and function better during the day. 3. Rise on Your Own. Nothing sets me off quicker than being woken up to something unpleasant (read: kids fighting, someone screaming for me, realizing I’m late etc.) I don’t always have the self control to do this, but on the days when I set my alarm and wake up before anyone needs me our mornings have a completely different tone. Just being able to go to the bathroom, get dressed, brush my teeth and check my phone (which takes a total of about 5 minutes) before anyone needs me makes a HUGE difference in my state of mind and ability to cope with daily tasks during the morning hours. 4. Eat a Good Breakfast. Breakfast is huge. I don’t know if this has to do with me not being a morning person or not, but I typically am not hungry in the mornings. I could go hours without feeling hungry or realizing I need to eat. After hearing about a million times how breakfast is the most important meal of the day, I started to make an effort to eat something first thing in the morning, whether I felt like it or not and it has made WORLDS of difference. I have realized it doesn’t have to be a big elaborate breakfast to fuel me and give me that energy lift, in fact, the opposite is true! I have been loving the new Plenti oatmeal meets greek yogurt combinations. They are filling, delicious, and literally all I have to do is grab a spoon and I’m ready to go. Whether I am running out the door or eating while I feed the kids Plenti could not be easier or more perfect for my busy morning needs. Because I have loved Plenti so much, I am giving away a week supply over on our instagram right now, so be sure to enter! They have six flavors, apple cinnamon, maple brown sugar, peach, blueberry, strawberry and vanilla and I literally haven’t tried one I haven’t loved! They are hearty and healthy and a great source of protein. 5. Be Positive. I know it sounds silly, but attitude really is everything. Before I fall asleep at night I tell myself, “tomorrow is gonna be a good morning” and I do my best to carry that attitude into the morning whether I am feeling it or not. If you have to be up, you might as well embrace it, and make it more enjoyable for others to be around you! Do any of you have any other great tips that help you get through your mornings? I would love to hear them if you do!